The Castello Ducale is one of the Residences of the Royal House of Savoy, dating from the 12th century, originally a possession of the counts of San Martino. In the 17th century it was turned into a rich residence by count Filippo d'Agliè, but was ravaged during the French invasion of 1706. In 1765 it was acquired by Charles Emmanuel III of Savoy and sold it to his son Benedetto of Savoy who had it radically renewed ten years later, under design by Ignazio Birago di Bòrgaro. From then on it was a summer residence for the Kings of Sardinia. It was sold to the Italian state in 1939. The Castello Ducale has a monumental façade with two stairs and a fountain; the interior includes 300 rooms, mostly provided with contemporary furniture. The castle is surrounded by large English- and Italian-style gardens. 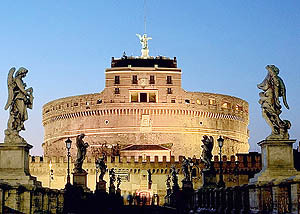 The Mausoleum of Hadrian, usually known as the Castel Sant'Angelo, is a towering cylindrical building in Rome. It was initially commissioned by the Roman Emperor Hadrian as a mausoleum for himself and his family. The building was later used by the popes as a fortress and castle, and is now a museum. Much of the tomb contents and decoration has been lost since the building's conversion into a military fortress in 401 and inclusion by Flavius Augustus Honorius in the Aurelian Walls. 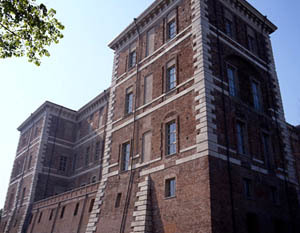 The Papal state used Sant'Angelo as a prison. Giordano Bruno was imprisoned there for six years. Executions were carried out by the Catholic Church in the small interior square. As a prison, it was also the setting for the third act of Giacomo Puccini's Tosca from whose ramparts the eponymous heroine of the opera leaps to her death. 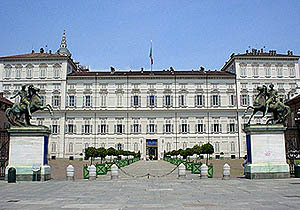 The Palazzo Carignano (Carignan Palace) is a historical building in the centre of Turin which currently houses the Museum of the Risorgimento. It was once a private residence of the Princes of Carignan, after whom it is named. It is famous for its unique rounded façade. It is located on the Via Accademia delle Scienze. 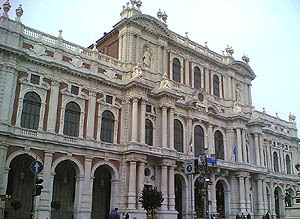 The construction of the Palazzo Carignano was ordered by the Prince of Carginan, Prince Emanuele Filiberto of Savoy, son of Thomas Francis, Prince of Carignan and his French wife Marie de Bourbon. Construction started in 1679. The building, constructed in brick in a typical Baroque style, has an elliptical centre façade. This facade offers the only domestic project to make use of the undulating 'concave - convex - concave' rhythm. It was the birth place of the first King of Italy, Victor Emmanuel II in 1820. 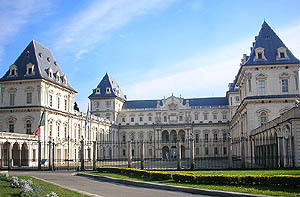 From 1848 to 1861 the palace was used for the House of Deputies of the Subalpine Parliament. the Royal Castle of Carlo Felice Savoy, a medieval fortress renovated during the 18th century into a stately mansion, one of the hunting residences of the royal family, it is today municipal property, and is still surrounded by wonderful Italian gardens; since 1997 it has been included among the UNESCO World Heritage Sites. The southern facade was designed by Guarino Guarini while the northern facade was based on a project by Benedetto Alfieri. Govone is a fine medieval borough near the Langhe Hills, situated in a strategic position over the Tanaro valley, halfway between Asti and Alba, the village is famous for its royal castle, where Jean-Jacques Rousseau resided for a time in 1730, and for a fine flower festival in spring. Palazzo Madama e Casaforte degli Acaja is a palace in Turin, northern Italy. At the beginning of the first century BC, the site of the palace was occupied by a gate in the Roman walls. Two of the towers, although restored, still testify to this original nucleus. After the fall of the Western Roman Empire, the gate was used as a fortified stronghold in the defences of the city. Later the building became a possession of a secondary branch of the House of Savoy; in the early fourteenth century, they enlarged it into a castle. A century later Ludovico of Acaja rebuilt it in square shape. The form of this edifice is still clearly recognizable from the back section of the palace. In 1637 the regent for Duke Charles II Emmanuel, Christine Marie of France, commissioned the covering of the court and a revamping of the inner apartments. Sixty years later another regent, Marie Jeanne of Savoy, lived in the palace, conferring upon it definitively the nickname of Madama (Italian for Madame). She asked architect Filippo Juvarra to design a new Baroque palace in white stone, but the works halted in 1721 after only the front section had been completed. Since 1934 it has housed to the City Museum of Ancient Art. La Mandria is a park, which contains a number of royal palaces including the Borgo Castello. 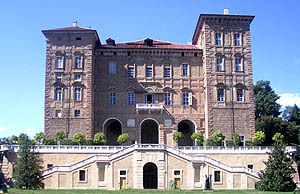 The Royal Apartment occupy the façade the Borgo Castello facing towards the Reggia di Venaria Reale. The estate was created in the second half of the 18th century as a centre for the breeding of purebred horses that would be used by the Royal Family for hunting with their train in the area of Venaria. 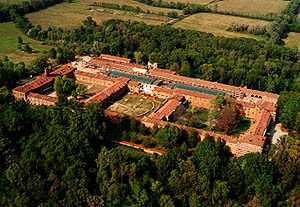 It is the Italy's largest historical park enclosed by a boundary wall (and the second-largest in Europe); La Mandria boasts remarkable 20 historical buildings, including several ancient farms, the remains of a medieval shelter, two hunting lodges (La Bizzarria and Villa dei Laghi) and Cascina Rubbianetta, today the seat of the International Riding Centre. The Castle of Moncalieri is a palace in Moncalieri (province of Turin), Piedmont, in northern Italy. The first structure was a fortress built by Thomas I of Savoy around 1100 on a hill, to command the main southern access to Turin. In the mid-17th century Yolanda of Valois, wife of Duke Amadeus IX, turned it into a pleasure residence. Architect Carlo di Castellamonte enlarged the construction substantially, and the interiors were redesigned by him and other local artists. The current structure of the castle is in the shape of a horseshoe facing south, with four massive square towers at each angle. The side sections have fived floors, brick walls and robust buttresses. Two other minor buildings parallel the side sections and create two courts. 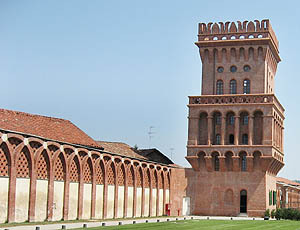 The southern façade has a giardino all'italiana and two small cylindrical towers, last remains of the 15th century castle. The northern entrance has also a notable belvedere. 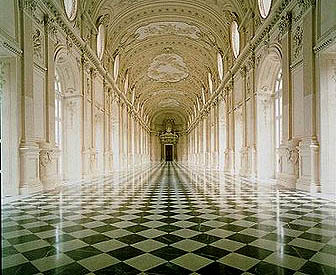 Since 1921 it has been the home of the 1st Battalion of the Carabinieri, but the historical rooms can be freely visited. The royal estate of Pollenzo is located in the Piazza della Chiesa, Pollenzo - the home of Polenta. The castle here dates from the 12th century, but has been remodelled in several styles, most notably Neo-Gothic. It is connected to the St Victor's church, which houses the 16th century wooden choir stalls from Staffarda Abbey. Restoration work was entrusted to Ernest Melano and, from 1832 onwards, to the Genoese Pelagio Palagi, who would later work on Racconigi Castle and the Royal Palace at Turin. The estate is counted as one of the Residences of the Royal House of Savoy included by UNESCO in the World Heritage Sites list. The University of Gastronomic Sciences now has its seat in the royal estate of Pollenzo. The Royal Castle of Racconigi is a palace and landscape park in Racconigi, province of Cuneo, Italy. It was the official residence of the Carignano line of the House of Savoy, The first records of the castle are from around the year 1000, when Bernardino of Susa rebuilt an ancient manor, leaving it to Cistercian monks. 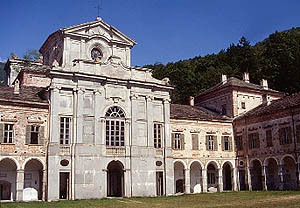 Emanuele Filiberto, Prince of Carignano, Tommaso's son, in the late 17th century, commissioned Guarino Guarini to transform the fortress into a pleasure residence. The architect erected the current central section where the court was, adding a pagoda-like roof. The two northern towers were replaced by pavilions with dome roof and square plan, provided with white marble lanterns. The gardens were also created. Emmanuel Philiberto created a magnificent wide park in the jardin à la française style that opens for the castle's northwards view. It was designed by the renowned 17th century by the French landscape architect André Le Notre, known to him for designing the gardens of Versailles radiating from Château de Versailles. In the late 18th century the English Landscape garden style was introduced. 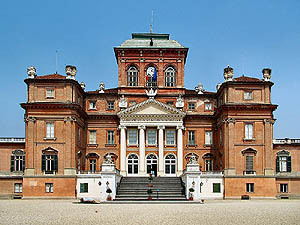 Royal Palace of Turin or Palazzo Reale, is a palace in Turin, northern Italy. It was once part of an old Bishops palace and later the royal palace of the House of Savoy. It was modernised greatly by the French born Madama Reale Christine Marie of France (1606-1663) in the seventeenth century. The palace was worked on by Filippo Juvarra. It includes the Palazzo Chiablese. The Chapel of the Holy Shroud, the current resting place of a bogus relic known as the Shroud of Turin, was added to the structure in 1668-1694. 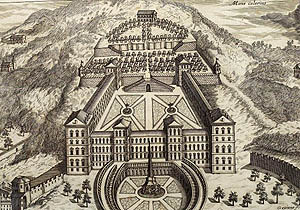 In 1946, the palace was claimed by the Italian Republic and made a Museum of the life and works of the House of Savoy. Its rooms are decorated with rich tapestries and a collection of Chinese and Japanese vases. The Royal Armory houses an extensive array of arms, including examples from the 16th and 17th centuries. The Scala delle Forbici is a much-admired staircase by Filippo Juvarra. The Villa della Regina is a palace outside the city of Turin, Italy. It was built by the House of Savoy in the 17th century. The original building, known as the Vigno, was built for the Maurice of Savoy during the reign of his brother Victor Amadeus I, Duke of Savoy. The property was built as a private villa with its own vineyard. In 1684 it passed to Anne Marie d'Orléans, niece of Louis XIV of France, and wife of Victor Amadeus II, Duke of Savoy. She used the Vigno when she could. Most of the present décor dates from her lifetime. Her husband was the King of Sicily from 1713 till 1720. From then on, the building was known as Villa della Regina, "Villa of the Queen". Anne Marie's eldest daughter Maria Adelaide came here and tried to recreate it at Versailles at the Menagerie. It remained the property of the House of Savoy till 1868 when it was donated by Victor Emmanuel II of Italy to the Institute of the Army's Daughters and in 1994 it was given to the State. Today it is today open to the public. The Castle of Rivoli is a former Residence of the Royal House of Savoy in Rivoli (province of Turin, Italy). A castle was probably built here in the 9th-10th centuries, but its existence is mentioned for the first time only in 1159, in a charter by Emperor Frederick Barbarossa that ceded Rivolese territories to the bishops of Turin. The House of Savoy acquired Rivoli in the 11th century. They soon found themselves at war with the local bishop and the castle was damaged. The present building was built in phases between the sixteenth and twentieth centuries. The building was damaged during World War II, and remained in a substantial state of abandon until 1979, when new works of restoration were begun. In 1984 the castle was reopened as seat of the Museo di Arte Contemporanea (Contemporary Art Museum), one of the most known in Europe. The Palazzina di caccia of Stupinigi is one of the Residences of the Royal House of Savoy in northern Italy, part of the UNESCO World Heritage Sites list. Built as a royal hunting lodge in the early 18th century, it is located in Stupinigi, a suburb of the town of Nichelino, 10 km southwest of Turin. 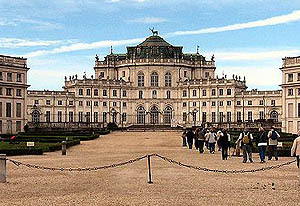 Its name in Italian means "the little hunting palace of Stupinigi". The original purpose of the hunting lodge is symbolized by the bronze stag perched at the apex of the stepped roof of its central dome, and the hounds' heads that decorate the roofline. The building has a saltire plan: four angled wings project from the oval-shaped main hall. The final building has a total of 137 rooms and 17 galleries, and covers 31,050 square meters. 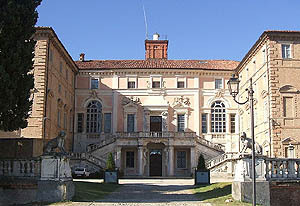 Today the palace houses the Museo di Arte e Ammobiliamento, a museum of the arts and furnishings. Since 1992, woods and agricultural land surrounding Stupinigi have been preserved as the Parco naturale di Stupinigi. Included in the communal territories of Nichelino, Candiolo and Orbassano. La Reggia di Valcasotto was erected some time around the 10th century. It later became a Carthusian Monastery and was destroyed by a series of fires. It was renovated during the 18th century. The monks were suppressed in the early 19th century during the occupation by French troops. Charles Albert purchased the property in 1837. Itt remained in Savoy hands until 1881. In that year, with only slight alterations to the original monastery, it became a castle, and was mainly used by Victor Emanuel II for his hunting trips. Humbert I decided, after 44 years as a Savoy possession, to sell it to private owners. The Castello del Valentino (Castle of Valentino) is an historic building in the north-west Italian city of Turin. 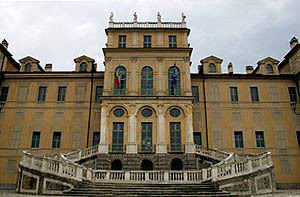 It is located in Valentino Park, and is one of the Residences of the Royal House of Savoy included in the list of UNESCO World Heritage Sites in 1997. The name Valentino, first mentioned in 1275, seems to derive from a saint called Valentine whose relics were venerated in a nearby church. The original castle here was bought by Duke Emmanuel Philibert of Savoy on the advice of Andrea Palladio. The current structure is due to Princess Christine Marie of France (1606-1663), wife of Victor Amadeus I, who lived here from 1630. It has a horseshoe shape, with four round towers, and a wide inner court with a marble pavement. Works lasted until 1660. 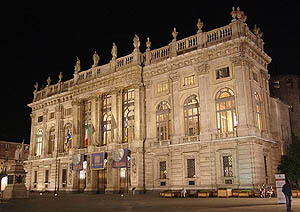 Renovations were carried out in 1860 when it was selected as the seat of the engineering faculty of Turin; it has been further restored in recent years. Today it is the central building of the Architecture faculty of the Polytechnic University of Turin. The Palace of Venaria (Italian: Reggia di Venaria Reale) is a former royal residence located in Venaria Reale, near Turin, in Piedmont, northern Italy. It is one of the Residences of the Royal House of Savoy, included in the UNESCO Heritage List in 1997, and one of the largest royal residences in the world, comparable in size and structures to those of Versailles and Caserta. The Palace was designed and built from 1675 by Amedeo di Castellamonte, commissioned by duke Charles Emmanuel II, who needed a base for his hunting expeditions in the heathy hill country north of Turin. The name itself derives from Latin, Venatio Regia meaning "Royal Hunt". Recent work has recreated the palace's park (destroyed during the French occupation) in modern style.